← 26th – 28th May 2015 – A few days away in Whitstable. Now is the time to prepare getting your tender plants ready to go outside in the big wide world (do check when your last frost date is though). So I’ve spent much of the afternoon moving various plants from the safety of the greenhouse to the garden table in preparation for them to be taken down to the allotment to their final resting place. I do it this way, then it’s a gentle move for them and they don’t get too stressed and freak out. Yes plants do get stressed and freak out it’s a well known fact (discovered by me). So out on the garden table in nice sturdy containers so I can move them easily are various brassicas including: Kale, Sprouting Broccoli, Cabbage, Kohl Rabi, Cauliflower and Brussels Sprouts. I also have some Squash, Nasturtiums and Peas and possibly a few other bits an pieces. There was a lot of going back and forth and confusing the chickens. Every time I walk past them, they seem to think I’m going to feed them!! They’re very greedy little hens. So you can see I’ve got a lot to put in the allotment in the next couple of weeks. All ready for the allotment!! Now that there’s more room in the greenhouse I was able to pot on 4 more of the Basil seedlings. These have grown quite considerably in the last 2 weeks. There are still some more to come, but I’ll wait for another couple of weeks and hopefully they’ll be large enough. I now have 5 small Basil plants so hopefully will get enough for some pesto!! I then potted on some of my Ambrosia Cantaloupe Melon seedlings into 3 inch pots. 8 seeds sprouted so hopefully they’ll grow well and I’ll get some fruit off them later in the summer. I’ll keep them in the greenhouse as they don’t grow well outside in the UK as it’s too cold. I have reserved some of the Nasturtium plants for the allotment because they’ll be great to grow near the beans because they’ll attract the pollinators, but I did sow some in the garden in hanging baskets. I’ve got some little sections in the fence that need a bit of coverage so hopefully these holes will get filled in. As with anything growing in a hanging basket it needs to be watered very frequently especially in the summer as they dry out quickly. Now the greenhouse looks less full, but will soon fill up again as the plants grow bigger. In the end I only want my Tomatoes, Melons, Okra and Aubergines in the greenhouse and everything else should be outside. I’ve got a lot of work to still do but hopefully I’ll get it all done in time. I’ve also been sorting out the shed and if any pots are either too small or broken they’re going straight in the bin. I’ve got so many at the moment. Having a good sort out is always rewarding. And finally I wanted to see how my Radishes were doing in my Salad bed. Very well is the answer. I harvested 4 lovely large and colourful ones. 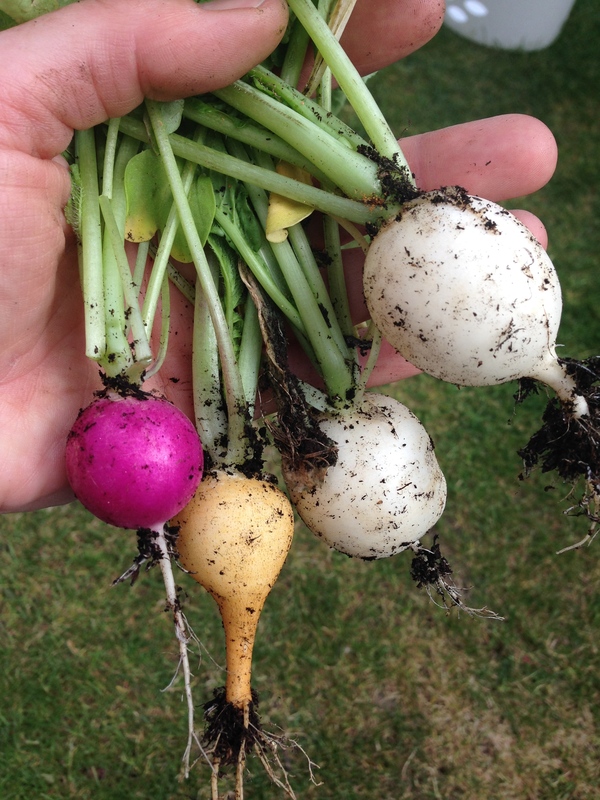 Lovely crisp, fresh radishes….including dirt!! Well I think that’s it for today, tomorrow look like it’s supposed to pour all day so I may get chance to hide in the greenhouse at some point, but we’ll see. As long as we don’t have any thunder and lightning strikes about 2 miles away like we had the other day then I’ll be ok. 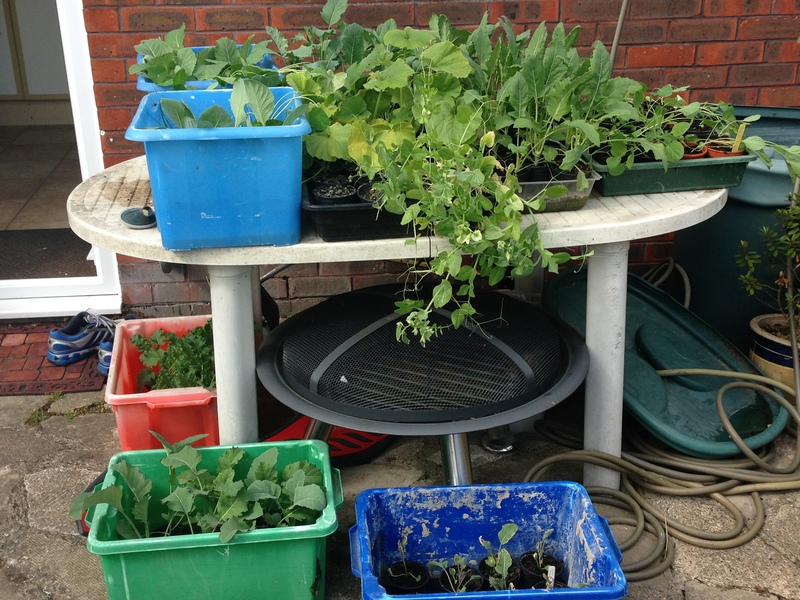 This entry was posted in Uncategorized and tagged Ambrosia cantalopue melon, aubergines, basil, Broccoli spring sprouting, brussels sprouts, cabbage, cauliflower, claire's allotment, kale, Kohl Rabi, Melon, Nasturtium, okra, peas, pesto, radish, squash, tomatoes. Bookmark the permalink. 3 Responses to Saturday 30th May 2015 – It’s time for a jiggle! I’ve not been able to get my coloured radishes to grow. But if the summer continues as it is, maybe the longer cool season will help. Anyway, yours look great! And I think John Jeavons, who wrote ‘How to grow more vegetables’, would agree with you about plants getting stressed. They do prefer the cooler temperatures. If it’s hot and dry it just makes them go woody and bolt very quickly. If you do get a hot spell water frequently.